Mahdi, hitherto known as a professor of philosophy, has devoted his considerable talents over a twenty-year period to finding the genuine text of The Thousand and One Nights. In an academic version of a detective story, he has turned up a remarkable tale. Much simplified, it goes like this: The stories themselves deal with the issue of heathen royalty's coping with revealed religion in the ancient Sassanid kingdom of Iran. The earliest extant manuscript of the Nights, dating from the fourteenth century A.D., consists of but ten stories. By good fortune, that manuscript happened to be the one that Antoine Galland, a French Arabist, acquired in 1701. Galland began publishing a translation of the stories in 1704, to wide popular acclaim. 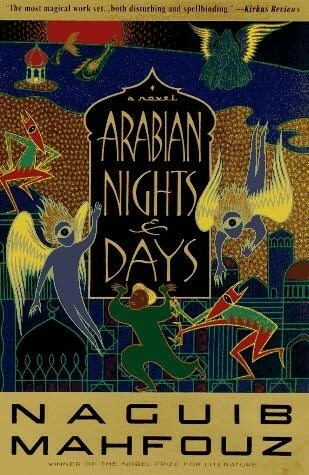 The cover of Naguib Mahfouz, "Arabian Nights and Days," U.S. edition. Unfortunately, Galland only had stories for 282 nights, not 1,001, so "under the spell of the title," he began the search for more. They did not exist, for "1,001" here is not a literal number but means "an indeterminate large number." Frustrated, Galland hauled in other Arabic stories and turned them into "Nights." When these ran out, he made up stories. With time, as other scholars took interest in the Nights, they quietly imitated Galland, fabricating out of whole cloth stories such as "Ali Baba and the Forty Thieves." In the process, the Nights grew "from a modest collection of relatively homogeneous stories . . . to vast collections of heterogeneous stories." This "bottomless pit" is what we now know as the Nights. Amusingly, scholars have devoted meticulous attention to the bogus eighteenth-century stories, culling from them information about medieval Muslim manners and customs. What does that say about their scholarship? Mahfouz, the Egyptian novelist who won the Nobel Prize for Literature in 1988 and was stabbed in the neck by a fundamentalist Muslim in 1994, has added to the pseudo-Nights literature with a wonderful set of fantastical stories about the town where the original Nights are supposed to have occurred. Normally known as a Balzac-type chronicler of the human comedy all around him, Mahfouz lets loose here with enchanting tales from a bewitched world-but one that illustrates a full range of human emotions and predicaments. Arabian Nights and Days may be the outstanding work of modern Arabic literature. Also, Doubleday has graced the book with one of the most stunning jackets of any book published in the United States in recent years. May 7, 2010 update: The new barbarians are trying to ban the historic Thousand and One Nights from Egypt. No word yet on Mahfouz's Arabian Nights.